For young art students. Art Masterclass with Claude Monet by (Cotton) – Joyce's mystery and fiction book reviews with some non-fiction too! This book is part of a series and I already know that I will enjoy whichever one comes next. This entry on Monet provides a brief biography and time line so that young artists will know more about who Monet was and and when he lived. They will also learn how the Impressionists got their name. In addition, there is information on what materials are needed in order to complete the projects in the book. That taken care of, creating can begin. At the end of the book there is information about each of the paintings in the book. 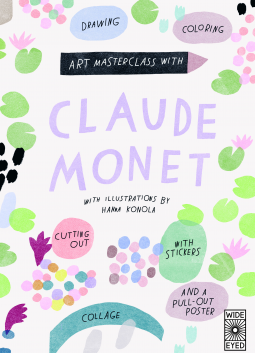 All in all, this was a good introduction to Monet and a chance for young artists to create. Thanks to NetGalley and the publisher for this e-galley. All opinions are my own.